Just a quick reminder that the Home Show will open today at Roberts Stadium from 5.00PM to 9.00PM. Saturday’s hours are from 10.00AM to 12.00AM and Sunday’s hours are from 11.00AM to 5.00PM. Kathy and I will be at the F.C.Tucker Emge booth on Saturday from 10.00AM to 12.00AM. Hope to see you there. Welcome to the Tri-State's largest 3-day event focusing on home-related products and services! The 61st Annual Fifth Third Bank Home Show presented by the Evansville Courier & Press is a true Tri-State tradition. The event, now in its sixtyfirst year, introduces homeowners and renters alike to a myriad of home improvement related businesses -- all in one place! 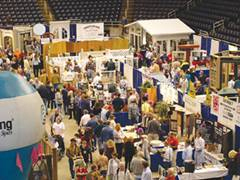 From kitchen remodeling to pools and yard barns, the Home Show provides an opportunity for consumers to shop and browse hundreds of booths and gain great ideas AND great deals at the same time.